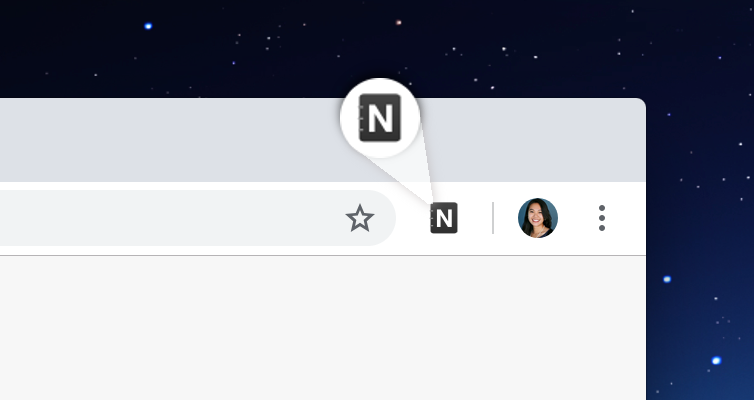 Whether you're using Notejoy for your own productivity or together with a team, it is an easy and powerful tool for capturing ideas, sharing it with others, and keeping the information you need searchable and easy to find. Make the most out of the tool by taking advantage of some of its key productivity features. 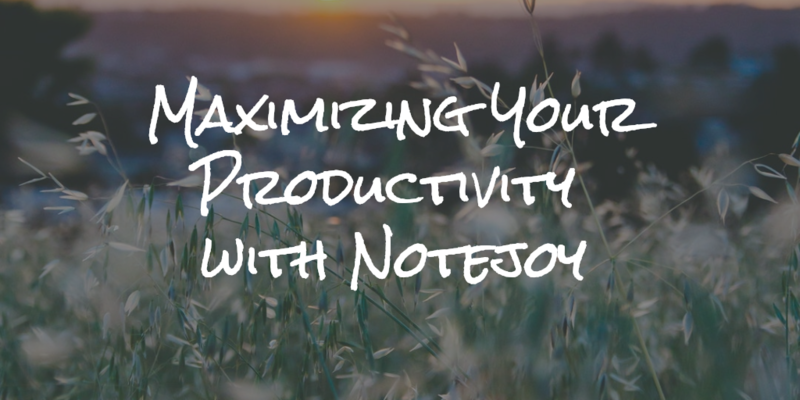 Here are 6 of our highlights for maximizing your productivity with Notejoy. When you're in the flow, it's vital to capture all of the key information and details as quickly as possible. In addition to a clean and fast editor that makes it easy for you to focus on the content, not the formatting, Notejoy also makes it easy with keyboard shortcuts and markdown. 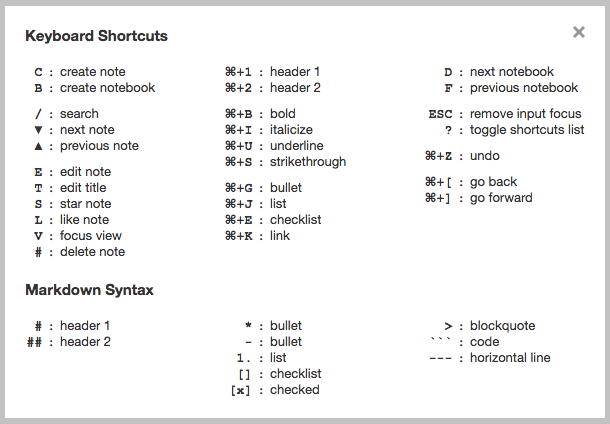 Notejoy's keyboard shortcuts make it easy for you to do things like create a new note, format headers, and go back and forth between notes all without having your fingers leave the keyboard. In addition to this, Notejoy even supports markdown syntax for applying formatting. Fast and simple ways to apply formatting saves a significant amount of time, and is often faster than just using a word processor or jumping back and forth to the toolbar when you're trying to get your best work done. Notejoy's web clipper is a browser extension that lets you easily clip web page articles, images, PDFs, and videos directly into Notejoy notes. You have the option of clipping a simplified version fo the article text and images, or you can just save a bookmark of the website URL to revisit later. It's great for saving any content you come across as part of your work, or easily maintain a central hub of searchable information to come back to so important details doesn't get lost in email and Slack. Once your content is clipped, you can set which notebook to save it into as a note. From there, it's simple to share and bring others in to the conversation. You can add a comment or @mention others to bring it to their attention and start a conversation. You can use it for things like collecting industry news to keep your team up to speed, saving instructions for getting something done, or gathering reference and source material while you're doing research. When it's important to focus on the content of one note at a time, Notejoy's focus view can really come in handy. Focus view expands the note to be full screen, hiding the list of libraries and notebooks as well as the note list. To activate it, click on the magnifying glass at the top right of the note window. Focus view comes in handy when you want to sit down and concentrate on one article without the clutter of viewing your other notebooks and notes. And, it also comes in handy when you want to project it on a screen and share it with teammates! Sometimes teams will use focus view in meetings when they are all jointly editing a note together, with one computer projecting and multiple participants viewing and editing at the same time. Tags are a super powerful way to organize your content in Notejoy. The power of tags in Notejoy is that there's really no wrong way to do it, so long as it helps you with being productive. Use tags as a way to manage your workflow. Have a tag for things you want to do, such as #toread #towrite #todo, or even take it to the next level and leverage them to track phases in a process such as a #researching to #draft to #published. 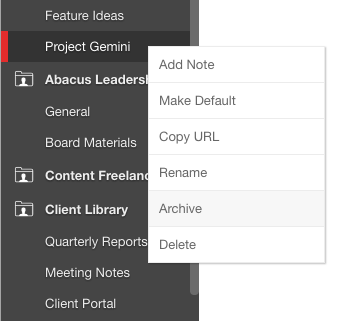 Use tags as a way to describe categories of information that are stored in a note. For example, you might want to label #onboarding documents or #newaccounts or #jobdescriptions. 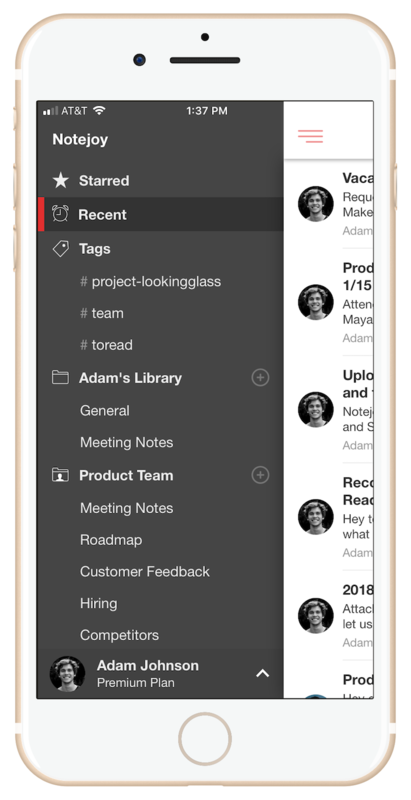 Use tags as a way to organize projects that your team is working on. For example, a cross=functional team might be working on a product launch for a new project. Even though people from sales, marketing, product, legal, and more are working on the project in their respective libraries and notebooks, typing it together with a #projectname allows you to see it all in one place. Adding tags in Notejoy is really easy. Simply type in a #tag directly into your note, and it will get indexed. If you don't want to have it indexed, use two hashes (##ignorethistag) to instruct Notejoy to ignore it as a tag. The saying goes, "change is the only constant." It's very common for documents to get out-of-date as new information and processes emerge. Maybe it's an old company policy or a completed project. The challenge is often that while we don't want others to mistakenly rely on that information, we also want to be able to look back and reference it in the future so we don't want to delete them. This is where archiving comes in. In Notejoy, you can archive notes, notebooks, and libraries. Archiving the item marks it as stale, hides them from browse lists, but are still searchable when needed. To archive an item in Notejoy, you simply right-click it and select Archive in the context menu that pops up. If you mistakenly archived something, you can always unarchive it. And archived items will still show up on search, so they'll be easy to find. Archiving can supercharge your productivity by giving your notes a spring cleaning and reducing the clutter. Whether it's just you or you're working with others, you can have a clean and organized workspace where it's clear what's current and what's outdated. Last but not least, Notejoy's integration with Trello can be a huge productivity time-saver. It brings Notejoy's collaborative notes together with Trello's powerful task management tools. If you're looking for a way to manage content alongside your tasks and to-dos, this powerful integration is worth checking out. If you haven't already, sign up for your Notejoy account - it's free to get started.